Back in January, when we reported what the very first official act of open European defiance by the then-brand new Greek prime minister Tsipras was (as a reminder it was his visit of a local rifle range where Nazis executed 200 Greeks on May 1, 1944) we noted that this was the start of a clear Greek pivot away from Europe and toward Russia. But most importantly, even back then we explicitly said that in order for Greece to preserve its leverage (something it found out the hard way it did not have 6 months later), it would need a Plan B, one that involves an alternative source of funds, i.e., Russia and/or China, which could be the source of the much needed interim cash Greece needs as it prints its own currency and prepares for life outside the European prison. The Germans were not happy: A German central banker warned of dire problems should the new government call the country’s aid program into question,jeopardizing funding for the banks. “That would have fatal consequences for Greece’s financial system. Greek banks would then lose their access to central bank money,” Bundesbank board member Joachim Nagel told Handelsblatt newspaper. Well, maybe…. Unless of course Greece finds a new, alternative source of funding, one that has nothing to do with the establishmentarian IMF, whose “bailouts” are merely a smokescreen to implement pro-western policies and to allow the rapid liquidation of any “bailed out” society… Which naturally means that now Russia (and China) are set to become critical allies for Greece, which would immediately explain the logical pivot toward Moscow. As it turns out, none of this was a joke, and, if Greek newspaper “To Vima” is to be trusted, a “Plan B” involving an emergency $10 billion loan from Vladimir Putin which would be used to fund a new Greek currency, is precisely what Greece had been contemplating! 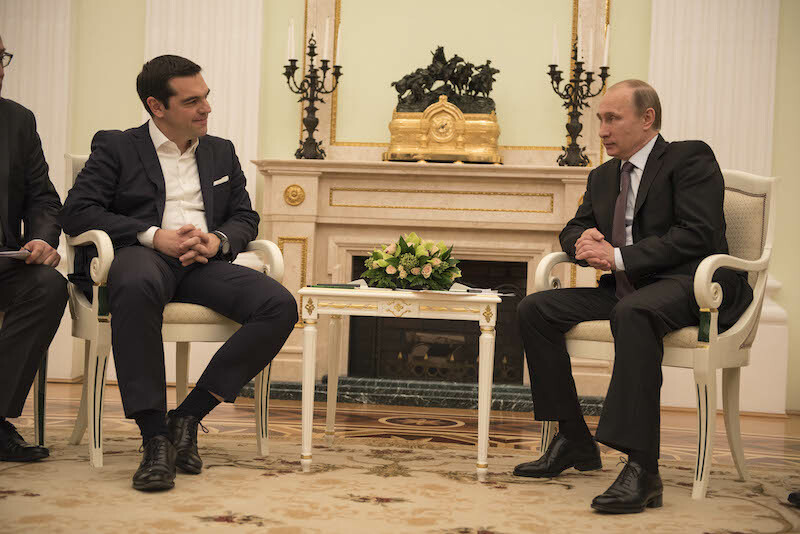 According to Greek Reporter, Greek Prime Minister Alexis Tsipras has asked Russian President Vladimir Putin for 10 billion dollars in order to print drachmas. But the biggest stunner: it was Putin who declined the offer on the night of the referendum. to German Chancellor Angela Merkel and sign the third bailout package. In other words it was not Tsipras’ failure to predict how Greece would react to the Greek referendum nor was it his secret desire to lose it as previously suggested (expecting a Yes vote and getting 61% “No”s instead), but a last minute rejection by Putin that lead to the Greek government’s capitulation, and the expulsion of Varoufakis who most certainly was the propagator of this plan. It also means that Merkel suddenly has a massive debt of gratitude to pay to Vladimir, whose betrayal of the Greek “marxists” is what allowed the Eurozone to continue in its current form. The question then is what is Vlad’s pro quo in exchange for letting down the Greek government (and handing over its choicest assets to the (s)quid), whose fate was in the hands of the former KGB spy. Finally, it is very possible that To Vima is taking some liberties with truth. For confirmation we would suggest to get the official story from Varoufakis, who lately has been anything but radio silent. If confirmed, this will certainly be the biggest and most underreported story of the year, one which suggests that the perpetuation of Merkel’s dream of a united Europe was only possible thanks to this man. If confirmed, first and foremost look for a growing schism between Europe and the US (which has clearly been pushing Merkel’s buttons via the IMF’s ever louder demands for a debt haircut not to mention Jack Lew’s rather direct intervention in the Greek bailout negotiations) and an increasing sense of friendly proximity between Berlin (and Brussels) and Moscow. The biggest loser in this game of realpolitik, once again, are the ordinary Greek people.